I generally look at a Dutch newspaper on line every day and have noticed that there is frequently footage from dashcams. The screen text on this one says that "the cause of the incident is unknown." Glad no one was hurt but it looks scary enough that I don't think I'd want to try it. I'm surprised the trailer didn't just rip off the hitch. At least it remained upright. The way the driver continued to the side of the road suggests it wasn't his first rodeo. No thanks. Tiny European car pulling big American-style house trailer. As Toolman would say, "Uhhh Uhhh Uhhh! Peter, I don't recognize the specific car, but you have just reminded me of the difference between Holland and here. In Holland, that's a large (or at least largish) car, certainly not tiny. 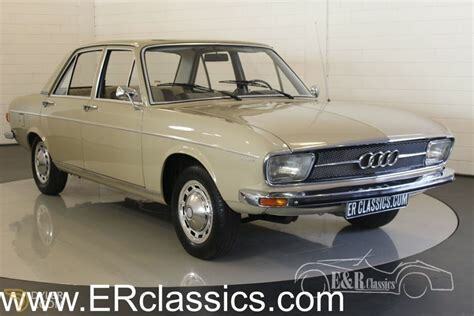 When Anja and I bought an Audi 100GL, her sister said to her, "Thank goodness. Now we're not the only people in the family with a big car." We pulled a similar camping trailer all through Scotland with that car. It's called "fishtailing" and happens when the trailer sway takes over the tow vehicle. A tail wagging the dog scenario. I hope they packed an extra pair of shorts, as they probably needed a clean pair. If you don�t have over two hundred pounds of weight on the trailer hitch you need to keep the speed down to ten miles per hour. Travel trailers are built with the kitchen in the front to keep the weight forward. The trouble is that that leaves the rear for beds and closets which people tend to store full of heavy things which causes a giant weight shift to the rear. I would guess that trailer in the Dutch news video was probably overloaded in the rear causing a lift on the back end of the car when going over bumps. I always measure how high the hitch ball is above the ground before hooking up, then again after the loaded trailer is hitch on. If the rear of the tow car does not go down some I know I am in for trouble. Amazing how some people�s idea of car size can be so different. Anyway, as we stopped inside the ship a car pulled in and parked beside us. My wife looked out her window at it and said, � wow, that is a really big car�. It was a �38 Chevrolet! My kids referred to my �76 Nova two door coupe as a Limo. On the third day of our honeymoon in 1969 my new wife and I came upon a similar sight on the road between Geelong and Melbourne. The results were more drastic. The van was on its side, with the car rear dangling from the caravan drawbar. The guy was frantically hacksawing at the drawbar to free his car. We found out an hour or two later that the bushfire, the smoke plume of which we had been watching, had crossed that highway just 20 minutes after we had passed the spot. They apparently didn't know that you gotta keep the weight on the tongue of the trailer. If the load is rear of the axle you fishtail. That is essentially why I was given this little trailer for free. It was built in 1950 out of parts from a 1937 Ford (axle, wheels, hubcaps, spare carrier, tailgate, etc). As you can see, the builder placed too much of the trailer toward the rear which makes it easy to create a rear-heavy situation when it's loaded. In fact, you can't even haul it empty because of this. The builder's son gave it to me...called it a deathtrap and wanted it gone. However, the owner's son wasn't running it with a spare installed. Reinstalling the spare helped a lot. Then I mounted an ammo can forward of the spare with a jack and lots of other heavy stuff. That really did the trick. Now it can be hauled empty with no problems. And when I haul things in it, I make sure I distribute the weight properly. It's not ideal, but the price was right and I love the looks of it. Plus, it's built like a Sherman tank, unlike the little utility trailers you see for sale at Lowe's, Northern Tool, etc. My son and I were looking at those the other day, just for grins. We stood at opposite corners and were able to flex the thing like a piece of cardboard. It's shocking how badly made they are. My farming/towing experiences have shown that the "tail wagging the dog" syndrome also happens when the towed article is travelling faster than the towing vehicles ( like going down hill). Simple fix is to actually speed up and drive away from the load to gain control and then start slowing down in a more controlled fashion. Don't take any "panicky" actions. I never got to see it as the link was strange to me? There was a trailer smashed all too hell on the news the other day on I-75.It is unclear what happened but a truck started loosing it's load of log's and the driver of the trailer went to the median to avoid.I do not know the length of the travel trailer or what they were hauling with? The people said they were happy to be alive and from the pictures i believe them!! Bud in Wheeler,Mi. Another thing towing a trailer. When going downhill? Do so like driving a model T, slowly, and leave LOTS of room ahead of you. DO NOT have to slam on the brakes going down hill! If you have a good trailer braking system, try to only use the trailer brakes manually when going downhill. Even moderately decent trailer brakes may not prevent throwing a trailer into a full fledged fishtail if you slam on the brakes going downhill. I learned this very early because I listened to what I was told. But about thirty years ago, I was headed home from work (not towing a trailer), while up ahead some fellow was pulling a boat. Traffic was heavy, and he pushed it hard going up a long hill (my first clue). After we crested the top of the hill I could clearly see the traffic was near a standstill at the bottom where the freeway narrowed down by one lane (always backed up there). I now found that the boat fellow truly was an idiot. He continued at full speed limit halfway down the long hill. I KNEW what was going to happen. Sure enough, about two thirds of the way down the hill, he slammed on his brakes to slow for the stopped cars ahead. His trailer and boat almost instantly swung wildly side to side back and forth over and again. Because he was not even in the right hand lane? He not only practically destroyed the car in the lane to his left, but also the car in the lane to his right. As well as his boat. There is a reason I do not hang around alongside other people towing trailers. They may be idiots. (Although I rarely find antique car people that are anywhere near that bad.) I have been in the perfect wrong place to watch as other people towing trailers did something stupid and lost them because of it too many times over the years. By the way, I couldn't watch the link either, probably due to my "not quite a DSL" slow connection. I must be missing something. I've looked at the message but don't seem to find the link to the video. Sent a PM with the link, Tom. That sounds like a good fix for an ill-pulling trailer Eugene. After messing around with my old trailer for so long, I think I've gotten into the mind of builder somewhat. I think his vision was to place the axle exactly halfway between the hitch and the tailgate. 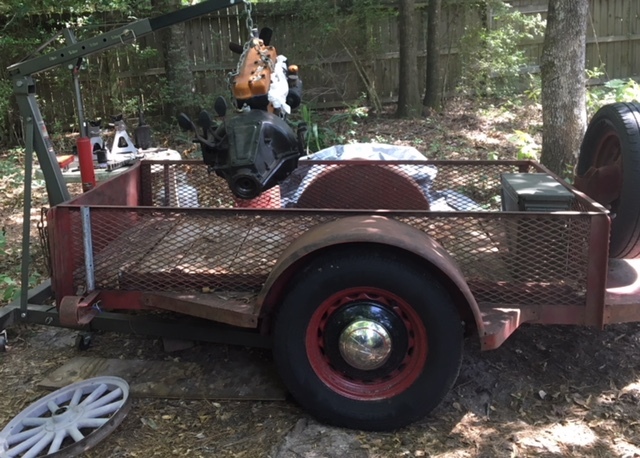 And then, with the heavy 1937 spare carrier and wide-five 1937 Ford wheel/tire/hubcap installed, you'd get a front heavy situation allowing you to pull it empty. His son was pulling it with no spare, creating a dangerous situation. I added a spare and a heavy toolbox and it pulls empty like a champ now. Unlike the brand-new little utility trailers, you have to be careful how you load it, but I always am. It leads a fairly easy life now and really only gets used to haul stuff to swap meets behind my '66 F100. Those two, paired together, look great...very much like any average Joe would've used back in the 60's. I get a lot of compliments about the pair. The new utility trailers take it to extreme with the axle placed very far rearward and I can't help but wonder if this isn't simply the manufacturers making them lawsuit proof. Proper trailer axle placement should be 3/4 the length of the entire trailer. I built mine to that spec and it follows like a tame puppy. Aside from my "fish tailing" story, I saw an M37 military truck on a large flatbed trailer being towed down the freeway once. The tow vehicle? A tiny SUV....packed with Mom, Dad and at least three kids. The m37/trailer must have outweighed that thing by at least 4000 lbs.!! I bought a truck, same as I was driving and towed it back home two hundred miles on a car dolly. On the return, it swayed bad once going downhill, was OK after that. After getting it home, I discovered that all four sway bar link bushings were completely missing. Something else to check for when you tow a vehicle.